A team of four HEC Montréal students finished 2nd in the Alberta International Business Competition (AIBC), an international business strategy case competition held in Jasper from November 12 to 18. 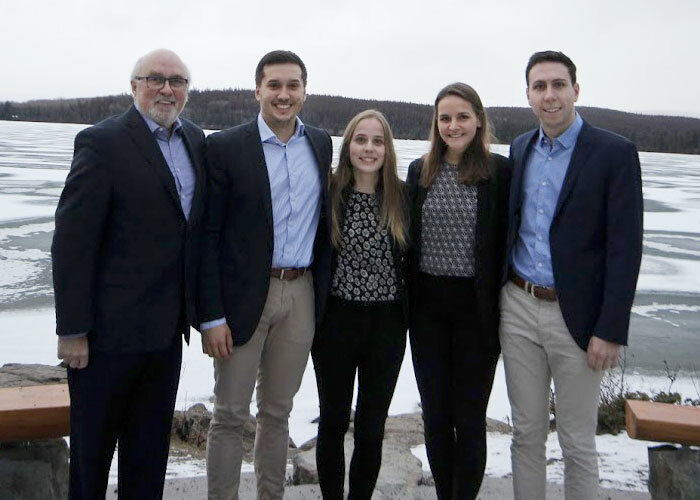 The team consisted of Louis-Charles Gauthier, Chloé St-Jean, Audrey Bond and Laurent St-Pierre, students in the Bachelor’s in Business Administration (BBA) program. The competition, now in its second year, brought together students from 12 universities in Canada, the United States, Thailand and China. The teams were given two cases for which they had to devise problem-solving strategies, and make a presentation each time to a jury. The second case, which the teams were given 30 hours to solve, called on knowledge of change management and information technologies. The School’s team came up with a three-part strategy that they called “BIG,” for “Bespoke Implementation Guidelines.” The winning concept took them to the final round, facing off against three other universities, and they won 2nd place after the final presentations to the jury. The coach for the HEC Montréal team was René Gendreau, who helped them prepare throughout the fall term.